Director François Truffaut’s rare foray into science fiction territory, Fahrenheit 451 ranks among his most notable films, even though it is one of his lesser known productions. Portraying a dystopian society where literature is banned, Truffaut uses architecture and buildings to convey the stifling sense of conformity of this future world. Fahrenheit 451 opens with a narrated title sequence, emphasising the prohibition of the written word. Based on science fiction writer, Ray Bradbury’s 1953 novel, set in America, Truffaut alters the setting to an anonymous city (filming took place in the UK and France) where modernist structures of concrete, glass, and steel enhance the film’s oppressive mood, and seem to restrict the characters’ freedom to move as well as individually express themselves. Both novel and film take their title from the temperature (451º Fahrenheit) at which paper starts to burn; in a sardonic twist on reality firemen in this SF-classic don’t put out fires but start them by tracking down and burning forbidden books and libraries. In the world of Fahrenheit 451, firemen are transformed into a state police, exercising control through the destruction of literature. In doing so individual thought is eradicated and social ‘equality’ is realised. Bradbury used his novel to criticise censorship and the burning of literature deemed subversive during the McCarthy era in the US (ca. 1947-1954), but it also echoes the Nazi book-burnings of the 1930s and ‘40s. And George Orwell’s ominous ‘Thought Police’ from his dystopian novel Nineteen Eighty-Four (1948), are reflected in the zealous firemen of both novel and film. 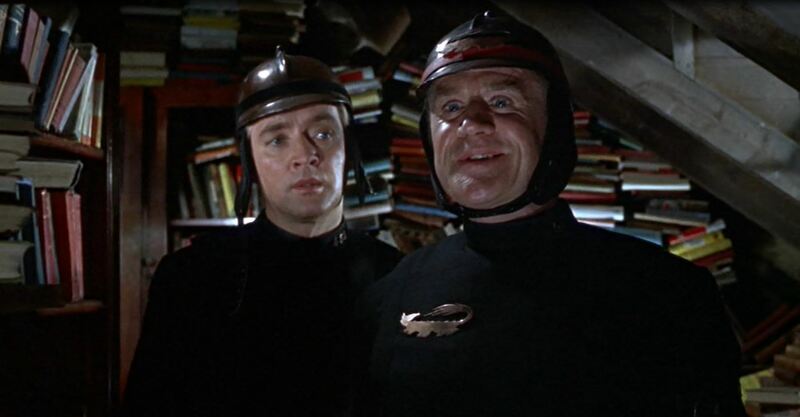 Guy Montag (Oskar Werner) is such a fireman: bland, docile, and obediently carrying out the orders from his superior, captain Beatty (Cyril Cusack). His unquestioning loyalty to the state results in an appointment for promotion, and he seems destined to rise quickly through the ranks. But things change when he meets his neighbour, the lively young teacher Clarisse (Julie Christie). She is part of an underground resistance (the Book People), fighting to preserve literature, freedom, and individuality. When Montag witnesses the death of an ageing woman (Bee Duffell) who chooses to die between her books, rather than give them up, he starts to question his blind obedience to the suppressive state. Montag becomes an avid reader, and as he learns about the hidden truths on the pages he worked so hard to destroy before, he sets out to preserve them. 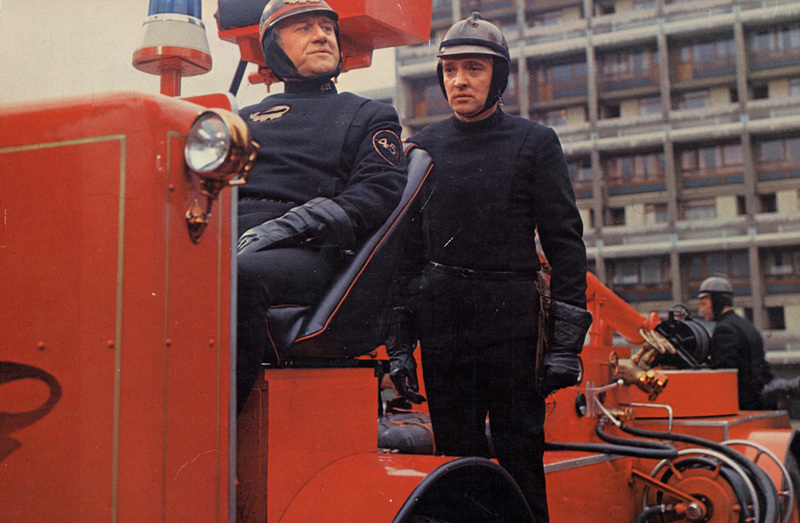 Ray Bradbury’s dystopian society of Fahrenheit 451 is brought to life in Truffaut’s film through repetitive visual cues that strengthen his objection to a totalitarian regime. Throughout the movie there is a juxtaposition of the modernist architecture infiltrating traditional architecture and natural landscapes. 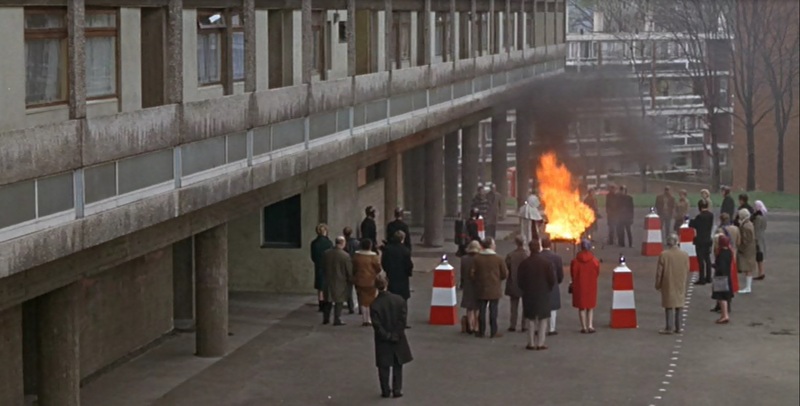 In the city (Truffaut and Director of Photography, Nicholas Roeg, filmed in the modernist Alton estate in Roehampton, South London and in Edgcombe Park, Berkshire, where Montag’s house is located) the viewer is confronted with concrete buildings. These structures are concerned more with the functional value rather than an aesthetic form. They promote the ideas of sameness as many structures tend to look alike with their dominant neutrality. Each building becomes an extension of the other, stamping out any individualistic flair that would have painted the city as anything other than uniform. As we move outward into the country, we can see the concrete arm of the totalitarian government, reaching out into the countryside through the railway sprawling out from the city centre. Here, in the presence of nature, sits the brutally present monorail (filmed in Châteauneuf sur Loire, France) cutting through the countryside, rising above the trees; marking its control with such a force that it cannot go unnoticed. 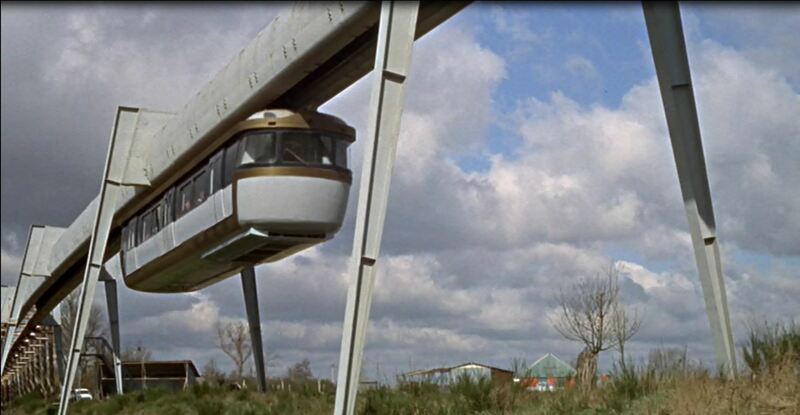 This suspended monorail, 1370 metres long and built in 1959 by engineering firm SAFEGE, then seemed to be the future of public transport. This was why Truffaut wanted to include it in his film, as one of few futuristic elements. Later the monorail project, originally planned to connect the Parisian suburbs with the city centre, was abandoned due to technical and financial difficulties. Modernist architecture is noted for its elimination of ornament and simplification of form. An outcome of modernist architecture is that it produced large housing estates with many buildings built internally and externally uniform. The central vision of many Modernist estates was to produce easily reproducible identical living units which would satisfy and reproduce communities ravaged and displaced from their terraced estates, destroyed in WW II. After WW II, a new generation of modern designers and architects, from Le Corbusier to Walter Gropius (Bauhaus), embraced the machine age as a means to improve the urban landscape and thus the lives of the people who lived there. Le Corbusier’s ‘machines for living’, for example, were intended to bring light, functionality, a sense of agency, and creativity. The Bauhaus created similar structures and interiors to improve living and education. Large sprawling streets were replaced with tall expansive high-rise apartment buildings. The new style of construction, using concrete, glass and steel as building materials, was economical and easier, making modernist houses available to everyone. Thus, modernist housing estates and architecture became ubiquitous in the suburbs of many British cities, including London where Truffaut shot scenes for his film. 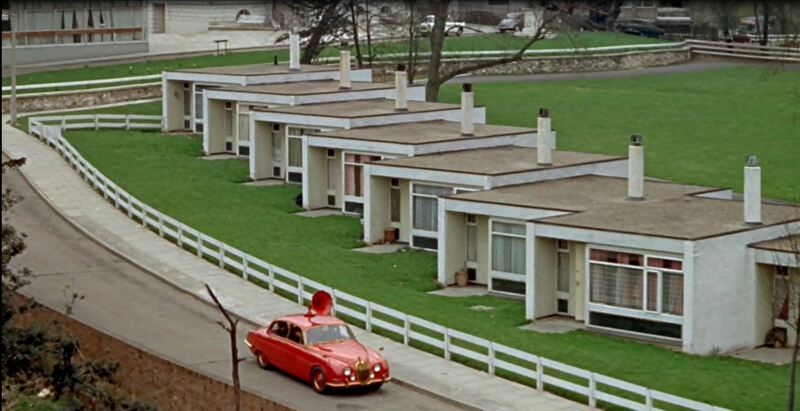 Another reason why Truffaut uses modernist architecture locations in Fahrenheit 451 is to produce a sense of the familiar. The film uses the 1960s modernist Alton estate to produce a future world built from contemporary architecture. This ensures that the future is not really ‘when’ but rather an extension or an extreme version of ‘now’. Science fiction has always used the future as a safe place in which to deal with the threats and concerns of contemporary society. 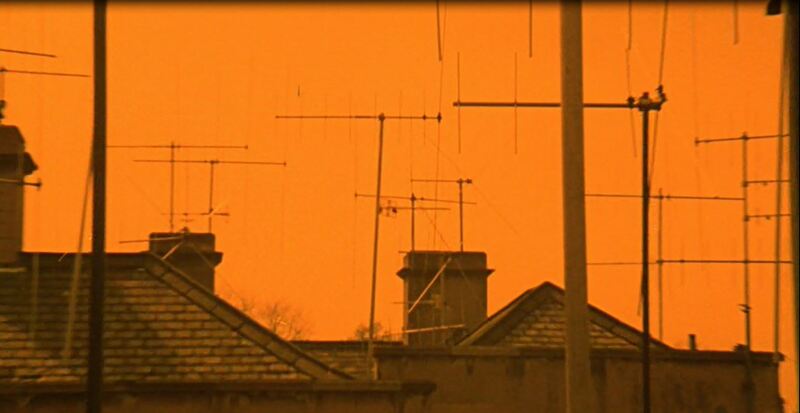 However, Fahrenheit 451 does not allow this act of distancing – normally provided by the setting of a different and unrecognisable future – because the vision of the ‘future’ in Fahrenheit 451 is evidently still very much the contemporary world of 1960s England, producing a critique of contemporary society and life that is unmistakable. 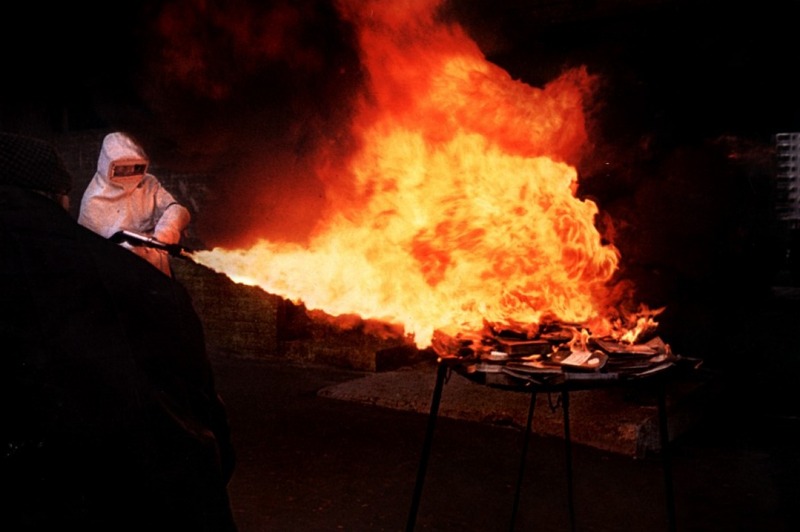 For instance, the books that the firemen destroy are contemporary 1960s British editions of familiar literary works, instantly recognisable to a cultured audience. The film creates a familiar future where uniformity has become so important that is has removed all elements of humanity. It could be said that Fahrenheit 451 is arguing that ‘ornament’, what modernist architecture and uniformity removes, is that which makes humanity so interesting, inspirational, and unique. Fahrenheit 451 communicates that ornament is the aesthetic response to understanding humanity as impossible to simplify, and that ‘simplicity’ of form is an attempt to dehumanise humanity. In doing so, Fahrenheit 451 criticises the modernist philosophy of architecture and similar rationalising philosophies. 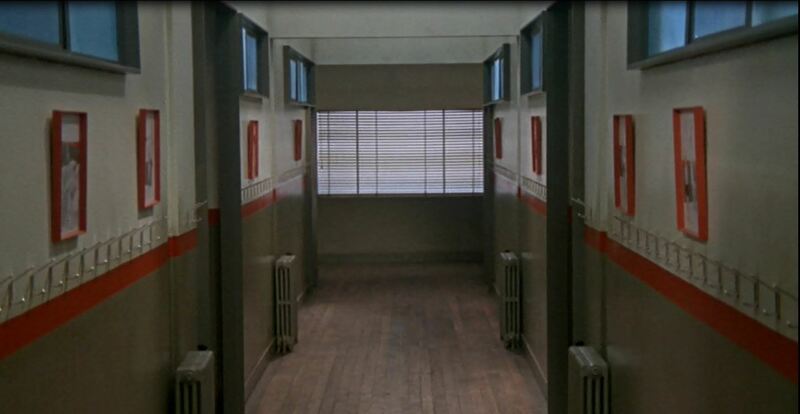 Fahrenheit 451 also uses visual imagery of interiors to offer an apt critique of totalitarianism. 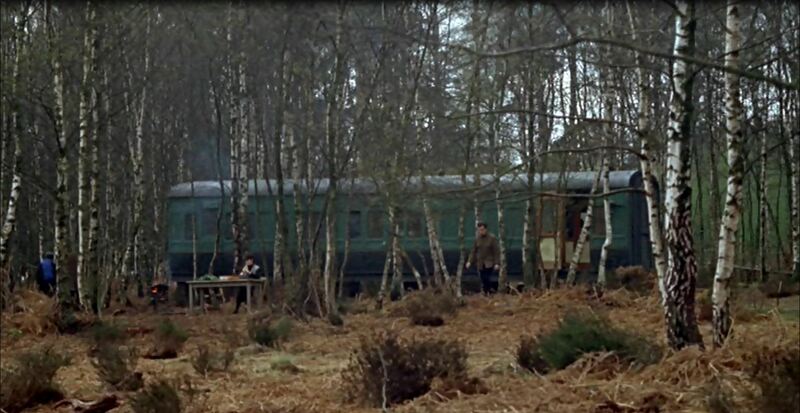 One can note director Francois Truffaut’s and production designer Syd Cain’s parallel between streamlined, bland modernist design and a top-down imposed culturally void mode of life. In the apparent utopian society of both novel and film citizens are ruled by the homes they live in and the interiors of those homes. Homes that are built by the government are fireproof; those that aren’t are deemed suspicious. The same goes for the way in which individuals entertain themselves, for all those who adhere to the government’s laws have televisions in their homes since they do not read to occupy themselves. Instead they watch mind numbing shows (e.g. ‘The Family’, offering a false sense of community through apparent interaction) that are in themselves controlling in the morals and values they relay. 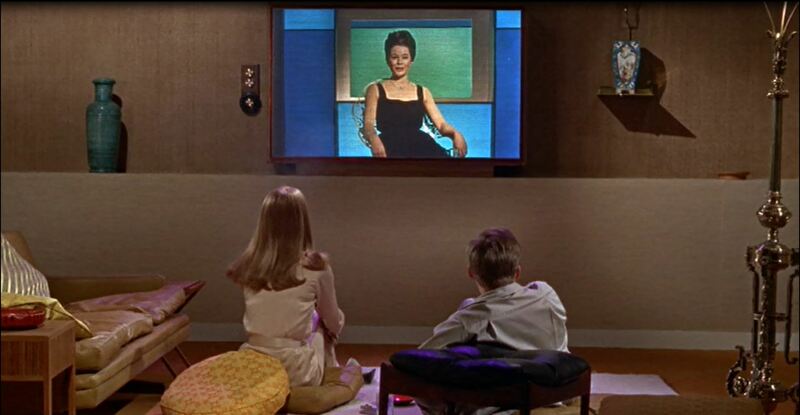 When Montag’s wife Linda (Julie Christie in a double role) is selected to be featured in ‘The Family,’ the on-screen characters are supposedly directly asking her for her input, whilst a red light blinks in a hypnotic manner. Although it may seem to Linda as if she is exchanging dialogue, she is merely interacting in a mindless fashion with the electronic devices of her home. When Montag’s devotion to his profession and beliefs in the established system wavers, the front door to his house no longer opens automatically on his command. Neither is he able to utilise the pole that previously slid him up and down the structure of his workplace, forcing him to manually use the stairs, which slows him down and marks him as peculiar to his colleagues. These failed interactions are indicating Montag’s break with the totalitarian influenced surroundings. In contrast, the characters that defy the state reclaim their agency by the familiarity they have with their individual homes and capability of hiding prohibited books. Book-reading characters, which eventually includes Montag, use their spaces and interact with their interiors on a different level compared to their subservient counterparts. Their homes become intimate sources of happiness and concealment. 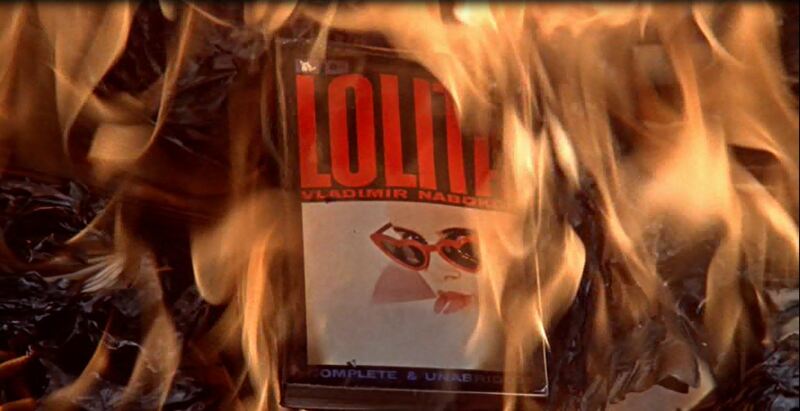 François Truffaut’s Fahrenheit 451 demonstrates a growing midcentury distrust of modernism and its association with totalitarian regimes, much like director Jean-Luc Godard used modernist locations in the Parisian office district of La Défense in his science fiction film Alphaville (1965). And, on a lesser grim note, Tativille, the specially constructed modernist film set for director Jacques Tati’s magnum opus Playtime (1967) was used to display similar concerns. The egalitarian and democratic ideals of modern designers and architects often led in practice to cold and barren structures of reinforced concrete that did little more than increase the state’s ability to monitor and control its citizens. In Fahrenheit 451, this control is willingly accepted and maintained by many characters. It is with care, with an interest in the people’s happiness, that books are withheld from them by the state and medication is liberally prescribed. Truffaut’s critique of modernism as metaphor for totalitarianism culminates in the introduction of the Book People’s space of inhabitance. In this forest dwelling (filmed in Black Park, Iver Heath, Buckinghamshire) the decorative takes the form of earthy interiors such as wooden huts and abandoned railway carriages, a mostly unaltered natural and spacious environment of trees, lakes and snow. Here the Book People live freely in the wilderness where geometric and architectural lines do not exist. Through this, we learn freedom reigns in the absence of constructed environments, perhaps indicating a return to nature as our only saving grace from totalitarian rule. However, as Truffaut ironically points out, the Book People, in order to preserve literature, seemingly work to destroy it and in doing so abandon their own identities. Through memorising and reciting they adopt a literary work, which is then burned to prevent permanent eradication by the state. In ‘becoming’ a book these persons are no longer addressed by their first names, but by their respective book titles, giving up an important part of their identity. Fahrenheit 451’s final image of the Book People wandering about their wooded sanctuary, reciting literature, feels ambivalent. As if, even in this natural habitat, where space is abundant and the conformity and confining architectural structures of the city are held at bay, people relegate themselves to prisons of the mind. Prisons of their own design, both literary and literally.